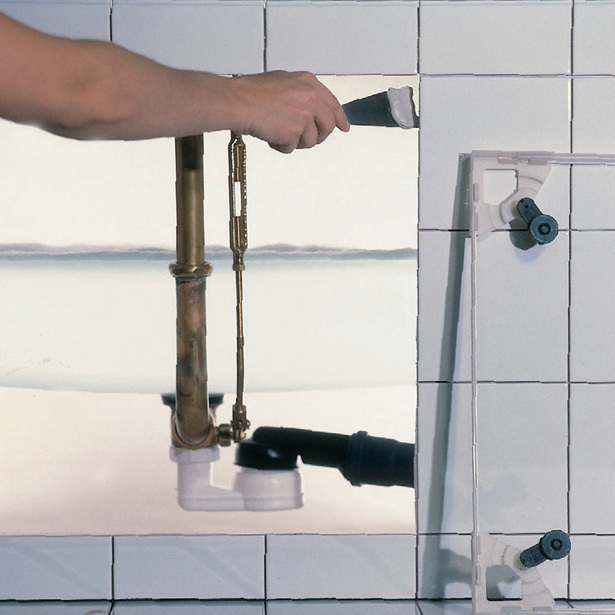 Anybody, who ever experienced a blocked-up drainpipe, a leaking pipe or the necessity of a repair while the entire wall is completely tiled or lined, will never ever forget that. There is a considerably easier system which will render breaking up or time and energy consuming dismantling unnecessary. Uniflex, the inspection opening suitable in any situation. One model for all sizes and countless applications. The mounting is as easy as child’s play and the opening is hardly visible. We offer a professional system for inspection openings that meets all the requirements of contemporary construction design with regard to technology and visual appearance! No accidental destruction of the covering in the course of the maintenance work. In the course of the opening, the covering is completely removed in no time.